The former head of the collapsed bitcoin exchange MtGox has been charged in Japan with embezzlement. 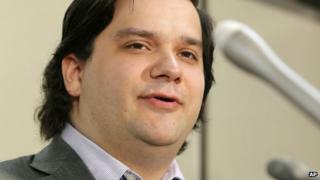 Mark Karpeles was arrested in August on charges that he falsified data about how many bitcoins MtGox possessed. MtGox shut down in February 2014 after it found that more than 850,000 bitcoins worth £132m had gone missing. At the time it closed, MtGox was the world's biggest exchange of bitcoins and handled about 70% of the transactions in the virtual currency. Mr Karpeles also faces charges that £1.7m in bitcoins was funnelled towards companies he owned a few months before the exchange closed. The charges were formally laid against Mr Karpeles as the six-week period that he could be held without charge in Japan was about to expire. Lawyers acting for Mr Karpeles told the Financial Times that he had done nothing wrong during his time as head of MtGox. MtGox was placed in administration by a Japanese court in April last year following its closure. In early August, a Japanese court ruled against a man hoping to claim compensation over bitcoins he lost when MtGox went offline. The Tokyo District Court said the currency was "not subject to ownership" and because of this it dismissed the lawsuit seeking repayment.